Fairbanks has fantastic weather. The light-filled summers are close to perfect. The temperature hovers around 70 and it is dry, not humid. The rain comes and goes and when the clouds part, the sun beams down and brings an abundance of life to gardens, flowerpots, surrounding hills, valleys and fields. During Midnight Sun Season, the sun&apos;s intensity lasts much longer than the summer sun in the lower 48. The sun sustains its strength well into the evening hours. And sunrises and sunsets seem to last forever and merge into each other. The sun lingers near the horizon – rising and setting – radiating an uncommon celestial light for hours. During Winter Season, temperatures are cooler but because it is a still, dry cold it is easily manageable with the appropriate clothing. 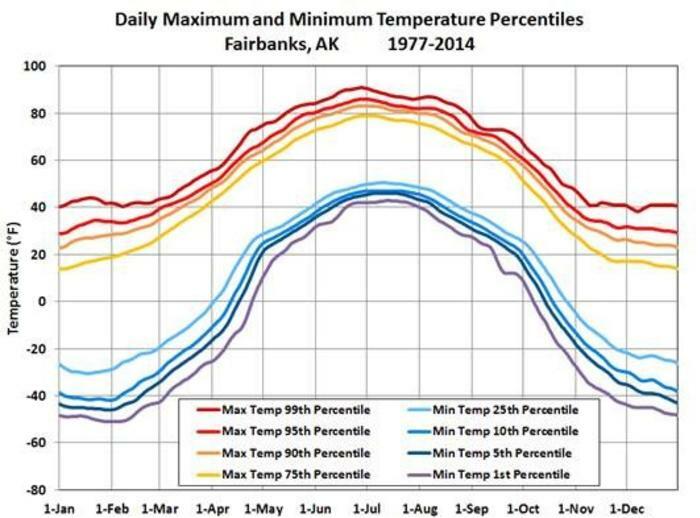 Another interesting characteristic of Interior Alaska weather is the wide temperature changes in a short period of time, particularly during winter months. It is common for the temperature to go from a toasty 25F above during the middle of a winter day to a chilly 35F below at night. People adjust rather quickly to the arid cold. After a cold spell, people shed parkas for jackets having become more resistant to winter temperatures. In the springtime with snow still on the ground and temperatures hovering in the teens and twenties, people are known to forgo jackets and even don shorts and t-shirts as they go about daily activities!